In a move the felt inevitable for Clemson, true freshman quarterback Trevor Lawrence has been named as the starter for this week’s game against Syracuse. The incumbent, Kelly Bryant, has had his ups and downs this season, especially in the passing game where the young future star, Lawrence, has continued to improve. 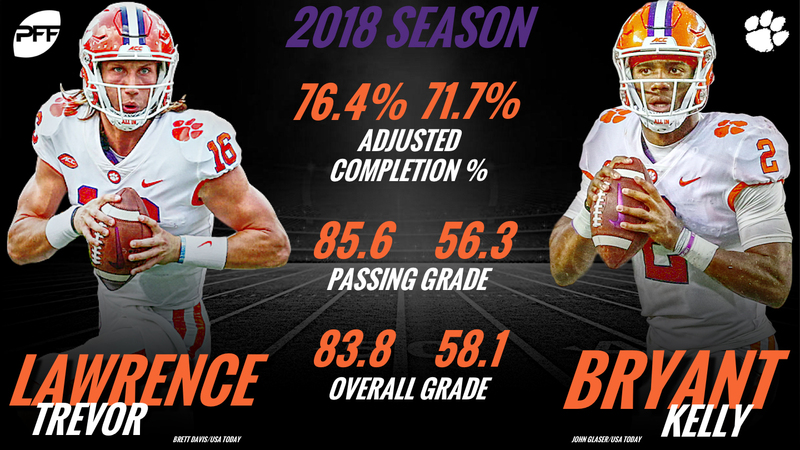 Bryant was solid as Clemson’s starter a year ago, but this season, there has been a noticeable uptick in the passing game when Lawrence has entered the game as part of their two-quarterback rotation. Now, four weeks into the season, the youngster has emerged as the future of the Clemson Tigers and it’s the right move based on performance. This QB breakdown is brought to you by Eckrich, the Official Smoked Sausage of the College Football Playoff. Here’s a look at how the quarterbacks stack up. Let’s start with the overall play where Lawrence has out-graded the more experienced Bryant in key areas. Starting with an 85.6 passing grade for Lawrence compared to a 56.3 for Bryant, the freshman has simply outplayed Bryant in their competition. Bryant bridges the gap slightly due to his rushing ability, but it’s not enough to keep Lawrence off the field. When it comes to projecting quarterback play, grading from a clean pocket is one of the most important metrics. 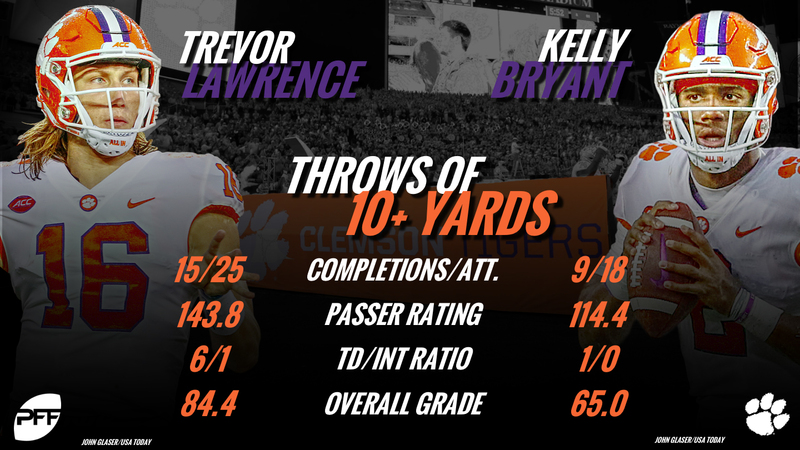 While it’s still early in the season, Bryant has struggled to a 54.2 grade in clean pockets, while Lawrence has excelled at 90.5, going 35-for-49 for 524 yards and eight touchdowns. Adjusted completion percentage tells the same story with Bryant at 71.7 percent and Lawrence at 77.1. The freshman has excelled at throwing in between the numbers where he’s hit on 7-of-10 for 191 yards and three touchdowns at 10-plus yards. That’s the next big difference between Lawrence and Bryant as Lawrence has been a more effective downfield thrower. On all throws at least 10 yards down the field, Lawrence is grading at 84.4 with a passer rating of 143.8 while Bryant has posted a 65.0 grade with a rating of 114.4. Lawrence’s arm strength and accuracy bring a different dimension to the Clemson offense, especially as they’re loaded with playmakers capable of winning at the catch point or creating after the catch. From Tee Higgins going up to get the ball over cornerbacks to emerging freshman Justyn Ross, Clemson has a plethora of big-play threats and they’ll be at their best with a quarterback who is capable of letting them tap into that playmaking ability. If there’s one place that Clemson’s offense will take a hit, it’s in the running game where Bryant is much better in the designed game and as a scrambler. He’s rushed for 158 yards on 26 carries this season after picking up 832 yards on 173 carries a year ago, but that part of the offense will be sacrificed in order to create explosive plays down the field. While Lawrence may have his usual freshman ups and downs, his ability to vertically stretch the field is too much to pass up for the Clemson offense, especially with their cast of receivers. There may be more pressure on running backs Travis Etienne, Tavien Feaster and Adam Choice as they lose the run threat that Bryant brings to the table, but Lawrence’s downfield passing should offset things as opposing defenses must commit more defenders to prevent big plays. Expect Lawrence to take Clemson’s passing offense to the next level.